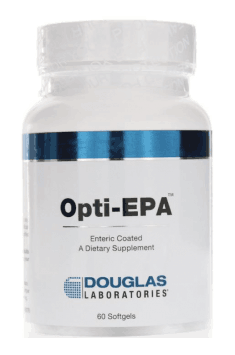 Douglas Opti-EPA Enteric Coated is a dietary supplement that provides high doses of omega-3 essential fatty acids derived from concentrated marine fish oil (anchovies and mackerel) OptiEPA ™. The product is in the form of soft enteric capsules and is an excellent source of eicosapentaenoic acid (EPA) and docosahexaenoic acid (DHA). Thanks to a special enteric coating, an unpleasant "fishy" flavor has been minimized. Fish oil is obtained mainly by extraction from fish tissue. It usually comes from species such as herring, tuna, and mackerel. Sometimes it is also obtained from the liver of other fish, including cod. The World Health Organization (WHO) recommends eating 1-2 portions of fish per week due to the extensive pro-health activity of omega-3 acids contained in them. Supplementation with omega-3 is therefore particularly recommended for people who do not like fish or rarely eat them. Another reason to ensure an adequate intake of these acids is that the western diet has replaced omega-3 with other fats, such as omega-6. This, in turn, has disturbed the ratio of the acids to one another, leading to an emergence of many lifestyle diseases associated with the Western lifestyle. Heart disease is one of the most common causes of death in the world. There are many risk factors that seem to be reduced by eating the right amount of fish fatty acids. The benefits of their consumption include, among others, ensuring an adequate level of cholesterol – they can increase the level of HDL ("good cholesterol"). In addition, omega-3 can reduce triglyceride levels by up to 15-30%. Another encouragement to their use is the fact that already small doses of fish fatty acids help to reduce blood pressure in people suffering from hypertension. They can also prevent the formation of clots that form in the arteries causing their hardening. They also make the already existing clots more stable and safer. Our brain is almost 60% built of fats, and many of which are the omega-3 fatty acids. They are therefore essential for the proper functioning of the nervous system. Some studies have shown that people with mental disorders probably have lower levels of omega-3 in their blood. Interestingly, the experiments show that supplementation of fish oil may prevent development or reduce the symptoms of some diseases. An example may be a reduction in the occurrence of psychotic disorders in persons in the group of increased risk. In addition, high doses of omega-3 can help to reduce the symptoms of both schizophrenia and bipolar disorder. Obesity is defined as a body mass index (BMI) of more than 30. Worldwide, as many as 39% of adults are overweight, while 13% are obese. These numbers are even higher in highly developed countries such as the United States. Obesity can significantly increase the risk of other diseases such as heart disease, type 2 diabetes or even cancer. Supplementation with fish oils can help to improve body composition and reduce risk factors for heart disease in obese people. What's more, some studies have shown that combining the consumption of omega-3 fatty acids with an appropriate diet and physical activity can promote weight reduction. A meta-analysis of 21 studies confirmed that fish oil supplementation helped to reduce waist circumference and waist-hip proportion. Omega-3 fatty acids play an important role not only in the brain but also as a structural element of human eyes. Studies show that people who do not provide the right amount of omega-3 are more likely to suffer from eye diseases. Sight deteriorates with aging, which can lead to macular degradation. The consumption of fish oils seems to be helpful in the prevention of this disease. In conclusion, Douglas Opti-EPA Enteric Coated is a natural, high-quality supplement with a versatile effect. It provides polyunsaturated omega-3 fatty acids – EPA and DHA, which are necessary for the proper functioning of the body, in particular, the cardiovascular and nervous systems. Omega-3 fatty acids may help in the fight against inflammation, especially of a chronic nature, which is the most onerous and hazardous to health. Fish oil can reduce the production of molecules associated with the formation of inflammation. Fish oil is probably safe for most of the people when it is orally-administered in small doses (3 grams or less per day). There are some concerns when it comes to administering it in high doses. Oral administration of more than 3 grams a day may reduce blood clotting and increase the risk of bleeding. The supplement may interact with contraceptive pills. Fish oils help to reduce triglycerides in the blood, whereas contraceptives may reduce their effectiveness by reducing their level in the blood. Interaction with hypertension drugs. Taking them simultaneously with omega-3 can cause too large reduction in blood pressure. This applies to drugs such as captopril, enalapril, losartan, diltiazem, and many others. Ultra refined fish oil concentrate, gelatin (capsule), glycerin, water, rosemary extract, ascorbyl palmitate, mixed tocopherols, ethylcellulose, coconut oil, ammonium hydroxide, sodium alginate and stearic acid.